When I was a little kid I would beg my parents to buy me every car magazine or book I saw. I read them over and over until sometimes the pages would just fall out of them. I remember seeing a picture of a GSM in one of those books . It was a coupe and it had a split window like the 1963 Corvette. I remember thinking it was pretty cool looking. I forgot all about GSM until tonight when I saw this car on eBay. 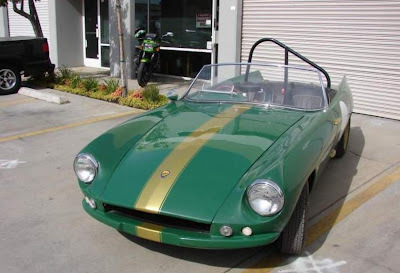 Glassport Motor Company (GSM) was a South African manufacturer of fiberglass sports cars. Apparently in their day they were very successful racers. Most seem to have come with Ford Cortina engines in them. The car being offered on eBay is interesting for a couple of reasons. First of all it's in the US. But most significantly, this one, according to the seller, is a Dart Alfa 1300. 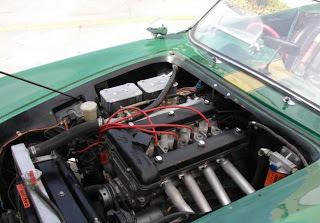 This car was factory modified in 1961 with the installation of a 1300cc Alfa Romeo engine and gearbox. It also has Alfa instruments. It is supposedly only 1 of 4 Dart Alfas built by the factory. I have no idea what this car is worth. It's rare, it has a racing history and it appears to be in remarkable condition. I suspect it's going to sell for quite a bit, but who knows? Click here to see the eBay listing for this car. Click here to find the GSM Car Club website. Another South African site, CarTorque.co.za, has a pretty good article on GSM. You can find it here. That is not the original GSM DART raced by Tony Kotze please read the REAL GSM STORY BOOK written by Sandy Brunette who worked at the factory. The Alfa Dart was Blue and white and has a specific factory number which I own.